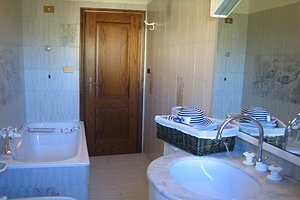 The cottage (6+2 sleeping accommodations) is situated close to Monte San Savino, a town of medieval origin in the province of Arezzo. 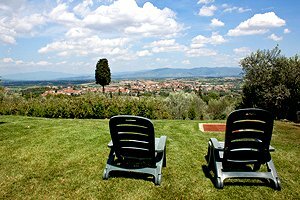 Standing on the hills of the Valdichiana region, the house enjoys a wonderful view of the surrounding countryside. 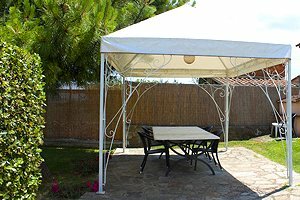 The cottage is an excellent starting point for visiting important Tuscan and Umbrian cities of art and culture, such as Arezzo, Cortona, Montepulciano, Siena, Florence, Assisi and Perugia, all easily reached by car. 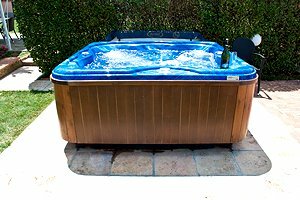 Provided with all comforts (satellite TV, DVD player, CD player, washing machine, gas oven, two working fireplaces and cot bed), the building is surrounded by a garden where are the swimming pool (10x5 m) with whirlpool corner and the barbecue equipment. At guests` disposal: car park and some bicycles. Heating and firewood are included in the rental price. The two-storey building (2 double bedrooms, living room with double sofa bed + double sofa bed and 2 bathrooms) covers a surface of 200 m². 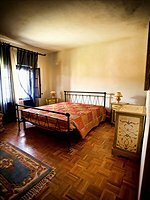 The ground floor composes of equipped kitchen, cellar, living room with canopied double bed and 1 bathroom with shower. On the first floor are a living room with double sofa bed, 2 double-bedded rooms, a storeroom and 1 bathroom with bathtub. The first floor features an independent entrance with balcony.